Erika DeJesus says she looks better now than she did in her 20's. See what she went through to get to sculpt her physique and how she plans to continue excelling! When I was a little girl I was on the ummm...'husky' side you could say, but when you're little people just say you're 'cute' when you're 'husky.' However, as I approached my teen years that 'cute' thing wasn't working anymore and I became very conscientious about my looks. I began distance running in high school and throughout college to lose some weight. During my junior year at college, I hurt my knees from all of the high-impact running and jumping rope that I'd been doing. The knee problem was probably exacerbated by the fact that I had also developed an eating disorder throughout high school and college. I was anorexic for seven years! I had the absolute worst image of my own body - no matter how thin I got I still saw fat on me! At my lowest point, I was down to barely 90 pounds, exercising constantly and eating very little. It was hard to focus, get through the day or even sleep! Ironically, the knee injury probably saved my life! I had to go to physical therapy to strengthen the muscles around my knees (in an attempt to avoid surgery). The physical therapists had me using light weights and exercises like leg extensions to do this. I couldn't run, but wanted to learn more about resistance exercises. And learn I did! I was very self-conscious about my body (still thought I was fat - go figure!) and didn't want to join a gym where there were so many people around. Instead, I bought myself a single weight bench and a few dumbbells and picked up Jane Fonda's Workout With Weights tape (the younger people reading this may not even know who she is!). That's how my weight training began at home! I also started reading about nutrition and slowly, in the privacy of my own home, began to see some curves developing on my body! I loved it! I was hooked! In 1983, I joined a gym and began to explore the variety of equipment and free weights they had there. I was like a kid in a candy shop! I read books on weight training including Joe Weider's books on periodization, muscle confusion, and various other training routines and techniques. I talked to trainers and tried many different routines - kept what I felt was working for me and discarded the rest. Many people in the gym love to talk too! They are usually more than happy to share what's working for them. Female bodybuilders, Rachel McLish and Cory Everson, were my idols in the early 80's and in 1985, when I was 25, I decided I wanted to do a bodybuilding show. I trained hard and followed my own attempts at a nutrition program for myself. I picked out some cool music, had choreographed a routine for the night show, and had a pretty suit! However...the night before the show I got cold feet and decided not to do it! Fast forward 22 tumultuous years to 2007...through two marriages, a full-time career in the insurance industry, the birth of my amazing son, and the companionship of my beautiful and loyal Akita, Cory, (named after Cory Everson!) my constant source of stress relief was the gym. I kept reading and experimenting with different routines, nutrition programs, and supplements. Time was my ally - there's definitely something to be said for muscle maturity! As I entered my late 40's, I reflected back on my life and thought about some of the goals I wanted to accomplish for myself. Getting up on stage and doing a bodybuilding show was definitely one of them! I guess you could say I'm a bit of a late bloomer! The first show I did was an OCB show at Cape Cod in June of 2007. I was so nervous, but this time I was determined not to back down! I took third place in the Open division against women who were half my age! Over the next few years, I went on to do three more shows, taking first place in the Open and Masters divisions in 2008 and second and third places in the other two shows. I'm shooting for my pro card this year! They managed to mix quads and biceps in this quadruple biceps pose! Over the years, I have tried everything such as Russian strength training, Hany Rambod's FST-7 training, circuit training, German volume training, 100's, split routines (two workouts per day - morning and night) and many others! Each has its pros and cons. The goal I aim for throughout the year is to stay relatively lean even in the offseason so I don't have to lose too much weight prior to a show. Ideally, I wanted to find a program that allowed me to maintain muscle size while leaning out and getting the definition that is needed to place well in a show. There's been a lot of controversy about this in the muscle magazines - some say it can't be done - that is, you either train for size and mass or you train for definition and cuts, but not both at the same time. However, the program I'm following now, which is Layne Norton's Power Hypertrophy Adaptive Training (PHAT) program does just that...I'm heavier and have more muscle mass on my body now than in prior shows, and yet, I'm still leaner than I've been four weeks out from my past shows. Here's a sample week from my current program...I do two planned days of HIIT cardio and two other days of the week I work in 20 minutes of moderate intensity cardio on a treadmill, elliptical, or bike when I can. Rest time varies between sets. For the heavy sets, I take more time; 3-5 minutes between sets. For the lighter sets and smaller muscle groups the rest time is shorter; 1-2 minutes or so as needed. What has consistently worked best for me in the offseason has been a periodized progressive resistance program. I need to focus on training a single muscle group each day so I can really hit it hard. I found if I train two muscle groups in a day that I'm holding back a bit on the first muscle group I'm training so I can reserve some energy and strength for the second muscle group to come! That doesn't work for me. I want to give each muscle group my full attention in the gym! I have to change up my routines every couple of months or so to keep my muscles guessing. Joe Weider's muscle confusion principle is key for me to make gains in my training. I tend to have a high metabolism, so in the offseason I usually do cardio only twice a week for 30-45 minutes a session. I like the stair stepper gauntlet machine; it really focuses on the glutes and quads. I'll do 20 minutes on a fat burner program on the gauntlet followed by another 20-25 minutes at a moderate pace on an incline on the treadmill. In the offseason, I choose clean foods for the most part: eggs, chicken, fish, lean beef, cottage cheese, and whey/casein blend protein shakes for my protein sources. For carbs, I choose primarily brown rice, Ezekiel bread, sweet potatoes, oatmeal, and occasionally pasta. I do have a sweet tooth and on rare occasions in the offseason I will indulge in my favorite sweet treat - a big piece of chocolate mousse cake or a big chocolate chip cookie! I eat 5-6 small meals a day with 30-40 grams of protein at each meal and a good complex carb. At lunch and dinner, I include fibrous carbs like brussel sprouts, broccoli or a medium salad with a small amount of olive oil and balsamic vinegar. I also allow myself 2-3 cheat meals per week, consisting of a few slices of a pizza, Chinese food, or a dinner out. I shoot for 1-2 gallons of water or fluid daily! I usually start my pre-contest nutrition program 12-14 weeks out before a show. For pre-competition, I drop carbs, increase my protein and good fats and the frequency and duration of my cardio sessions. I'm currently following a carb-cycling program - 3 days low of carbs; 1 day of higher carbs. It's hard to eat all of the protein I need in a day through regular food, so the protein shakes are a great way to add quality protein. The whey/casein blend provides my muscles with both quick uptake protein and a slower-release protein that continues to feed my muscles over the next few hours. My favorite is Beverly International's Ultimate Muscle Protein (vanilla or chocolate). Bodybuilding is so much more than just a display of physical strength and grace; it represents a true synergy of strength in body, mind, spirit, and purpose! I love watching my body change as I modify training routines and my nutrition programs! And there are many other health benefits to resistance training too - stronger bones, muscle tone and definition, improved cardiovascular capacity, clarity of mind and focus; it's the veritable fountain of youth! My son and all of you!! I've been at both ends of the spectrum with my weight - neither of which were healthy places for me to be! And I want to be around for a long time and feel energetic and strong to play with my grandchildren someday! Through trial and error, I've discovered the right foods and eating and training schedules that suit my needs and keep me strong and healthy. Maintaining my regular workouts and a generally clean food diet has helped me keep my metabolism high, my strength levels up, my outlook positive and hopeful, and my muscles defined and lean. In all honesty, I look better now than I did in my 20's! I can't stop the aging process, but I intend to be strong, graceful, and beautiful for many years to come! I am so very grateful for all of the learning experiences I've had in my lifetime and if I can share some of the messages I've learned with you, inspire you, and make a positive difference in your life by making an example of mine, then I will continue training until I'm 100 and then some! 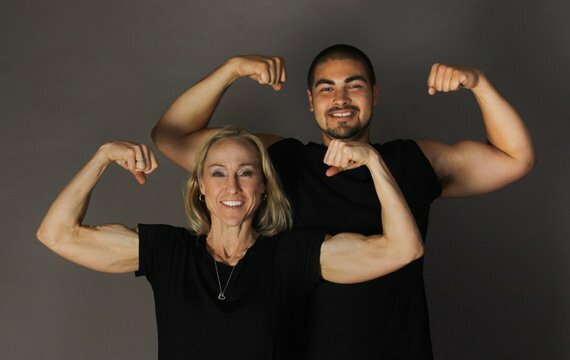 The goal of competing in a bodybuilding show was something I'd dreamed of since I was in my 20's and saw the strength, beauty and grace that the photos of Rachel McLish and Cory Everson evoked in the pages of the bodybuilding magazines. I wanted to be like them, strong and beautiful. As I got older, I still had this goal, but I have a clearer definition of my purpose. I want to inspire and motivate others, especially women, when I compete. I want to show them that they can do it too! Even if they don't take it to the level of competing, they can still look and feel their absolute best! We spend so much time taking care of others we often put ourselves last, but it's imperative to work some healthy 'me' time into each day! You are precious...and worth it! In December of 2010, I completed the International Sports Sciences Association Elite Trainer Certification program and am working with men, women and teens now to help them achieve their individual goals. I'm hoping to win my pro card this summer and will see where it takes me from there! I'm currently putting together nutrition and training programs for my own clients locally and am just beginning work on my own website now in the hopes of being able to reach many more and help them achieve their own unique goals. Be patient with yourself! Bodybuilding, figure, and fitness competitions are very unique disciplines. You need to find just the right combination of resistance training, cardio, timing and quantity of food and supplements for your own body. Of course, there are general rules of thumb to follow depending on your gender, age, body type, body fat percentage, etc., and those are good starting points, but you will soon discover the small tweaks you need to make if you are observant of your progress and willing to try new things. Keep asking questions and researching the areas of interest to you. For everyone reading this, especially you women, regardless of your age, it's never too late to start taking care of you! I'd like to share one of my favorite quotes with you here: "Courage doesn't always roar, sometimes it's the quiet voice at the end of the day saying 'I will try again tomorrow." Never, never, never give up!! My favorite female bodybuilders are still Rachel McLish and Cory Everson. In my opinion, they maintained the perfect balance of muscle and feminine grace and beauty. And for male bodybuilders, I'd have to say Layne Norton, PhD. He's an all-natural bodybuilder and has amazing size, symmetry and definition! I am enjoying working with him now for an upcoming competition this summer. I absolutely love the selection, price, and speed of shipment for the supplements and clothing items in the store! I also use the SuperSite section to research different workout plans and learn about the various supplements available on the site. The customer service is unparalleled! Warm and friendly! Every person who answers has their own unique and fun 'tag' names - like Jumpin' Jack. When I call with questions everyone is eager to help. I love the fact that I can place an order on one day and within 3-4 days my shipment arrives. It saves me from running to a local GNC and paying twice the price for my supplements. I use BodySpace occasionally. The comments I receive there motivate me! Thank you all who take the time to share your thoughts and feedback with me! I work full time and don't have a lot of extra free time now to participate much in blogs and forums, although at some point I look forward to using these features too. Lisa Thomas - Elite Fitness Training Studio Chicopee, MA - choreographed my night routine, helped me with posing, provided inspiration, motivation and much needed laughter! Gratitude: Above all I want to thank my son, Michael Angel (age 21) for his unwavering belief and faith in me! And not just with my bodybuilding endeavors, but for every dream or goal I've ever set. He has attended all of my shows, been patient and supportive and added a wonderful sense of humor to my life! He is my biggest fan (figuratively and literally - he's 6'3" and 230 lbs!) He is also one of my absolute best clients - having lost over 55 pounds with his own amazing determination and dedication (and the help of my workout programs and nutrition suggestions) over the past two years. It's always a wonderful feeling to take first place on stage, but Michael told me once that no matter how I place in a show I will always be number one in his eyes. I have a true champion of a son in so many ways! I'd also like to thank my boyfriend, Jon, who encourages and motivates me in and out of the gym and recognizes all of my strengths, not just the physical, and for loving me for everything I am and for everything I am not. You gotta admit, loving a bodybuilder isn't always the easiest thing to do, especially when they're dieting! Fortunately he too, like my son, has an extraordinary sense of humor and a heart full of love!